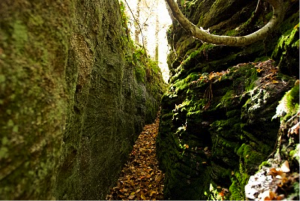 Along Upstate New York’s Seaway Trail between Rochester and Oswego there exists an unusual landform found in only a few locations in North America. Known by geologists as a drumlin field, hundreds of elongate north south oriented hills shape the countryside. Near Fair Haven a number of these drumlins come to an abrupt end by the lake in a series of highly eroded steep bluffs. The best known of these cliffs of clay is Chimney Bluffs east of Sodus Bay, now a State Park. Its outstanding feature is a series of knife-edged ridges, spires and chimneys whose improbable shape attests to the durability of mere sun-dried clay. 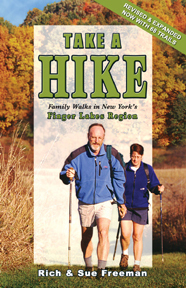 (A trail map and details are available in “Take A Hike – Family Walks in New York’s Finger Lakes Region”) However, several other bluffs with public access and hiking trails also show lesser, but still spectacular sculpting. Sitts and Scotts Bluffs east of Fair Haven and Port Bays respectively, present scenery nearly as interesting as the more often visited Chimney Bluffs. Another interesting badlands site is the located along the shore of the Sterling Nature Center just east of Fair Haven. A visit to one of these sites will probably turn up something of interest at anytime of year though spring and fall are ideal times for hiking. Bugs are few, temperatures ideal for mild exertions, and you are likely to have miles of empty beach to yourself at any of these sites. These cliffs of clay are one of the most dynamic and changeable landforms in central New York. Signs of the clash between lake and clay are obvious and sometimes dramatic. Yet the bluffs are also surprisingly tough and tenacious. Their resistance to erosion results in vertical slopes and strange shapes. As you walk along the foot of these clay cliffs, they loom above, austere and seemingly lifeless. Erosion proceeds rapidly, with up to three feet a year of land being carried away by water and wind. Outwashes of silt and clay form like miniature deltas at the foot of each gully carved by runoff. Sometimes a cliff is laced with dozens of shallow channels or rills, running down its face. Other times, several tons of clay has simply slumped off the main face in a big chunk, or you may see peculiar “caves” 4 or 5 feet deep formed by undercutting at the bluff’s foot. Dead trees slide inexorably down the face to become driftwood on the beach below, and in early spring you may note a darker horizontal streak running along the cliff face showing the presence of ground water. Often you’ll encounter a sizable rock, freshly dislodged from the clay that has then tumbled down onto the beach. Unlike the smooth water rounded beach stones, a rock that has recently washed out of the bluff still shows angles and corners. Sometimes you can even see scratches on its surface left by the passage of grit laden glacial ice over it 6,000 years ago. 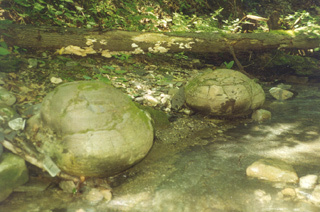 Though they look different with their water-rounded finish; the beach stones are identical to those from the bluff since the cliffs are the source of the beach. As you search for that ideal flat skipping stone, each rock tells its own story. The contrast in geological time scales seen along the lake shore is also striking. The clay cliffs are the insides of drumlins, piles of glacial till dating back a few thousand years to the last ice age. Inside the drumlin are rocks representing tens or hundreds of millions of years of earth history? And the beach underfoot and the gullies, rills, slumps, and slides of the bluff represent hours, days or weeks worth of erosion and form one of the most ephemeral of all local landscapes. There are a half dozen places between Oswego and Sodus Bay off the Seaway Trail with access and hiking on and by the beach. Lofty Scotts Bluff north of Wolcott at the end of a gravel drive that runs off Broadway Road features an impressive column of clay projecting twenty feet or more from its surrounding face. You’ll also get a superb vista of the lake’s shoreline curving away to the west on a clear day. A set of steps leads down to a long stretch of state owned beach backed by the Red Creek marsh area, offering excellent beach combing and bird watching opportunities. Chimney Bluffs, a State Park just east of Sodus Bay off Lake Bluff Road is certainly the best known cliff along this stretch of shoreline. And with reason. Its spectacular spires and ridges reach 150 foot above the lake. It, too, offers a number of hiking trails to explore beach and bluff. A smaller state-owned bluff lies at the end of Dutch Street running north off Lummisville Road just west of Wolcott. Here several hiking trails meander through the woods or follow Beaver Creek just east of the bluff though hemlock groves. Though not as lofty as Scotts or Chimney Bluffs, this bluff still offers an attractive overlook of the lake. Fair Haven State Park offers a view of privately owned Sitts Bluff just east of it, while a few miles further east, less spectacular, but more accessible McIntyre Bluff lies within the bounds of the Sterling Nature Center. The Nature Center is well worth a day’s visit as its volunteers have laid out over 15 miles worth of trails (find a map in “Snow Trails – Cross-country Ski in Central & Western New York” and in ““Take A Hike – Family Walks in New York’s Finger Lakes Region”) through the varied terrain of 1,400 acres. The Nature Center also boasts nearly two miles of Lake Ontario beach to explore and hosts a series of programs throughout the summer and fall at its lakeside year-round headquarters facility. It is a comparatively new tourist attraction, having opened just a few seasons ago, but the volunteers and staff have done a splendid job trail building. Recently the Nature Center also built a launch site on Sterling Creek for canoes and car toppers. You can put in here and then float down the east branch to Lake Ontario (find a map in “Take a Paddle – Finger Lakes Quiet Water for Canoes and Kayaks”). The Fair Haven area boasts a half dozen private camp grounds as well as RV camping at the state park. Grants Vacation Park in Fair Haven absorbs some overflow from the nearby park and Holiday Harbor on Blind Sodus Bay offers waterfront views and access. Another waterfront RV park option is Shon’s Boat Basin 1-(800) 524-9878, also offering waterfront cottages. This is also the home port of Silver Waters Sailing. We offer day trips on the lake that provide views of the shoreline cliffs east of Fair Haven aboard our 32-foot sloop. Call (315) 594-1906 for Silverwaters Sailing. 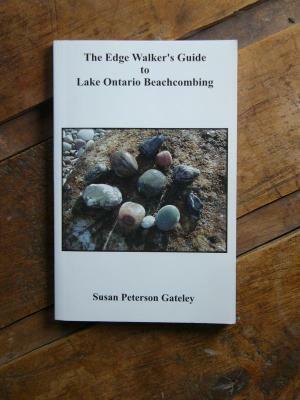 Editors note: Susan Peterson Gately is the author of “The Edge Walker’s Guide To Lake Ontario Beach Combing” and several other books as well as a newsletter called the Lake Ontario Log. Find out more about both at her web site www.silverwaters.com. If you’ve never been to Chimney Bluffs State Park, you should plan to go there. It is a truly unique and gorgeous place that was created by the force of glaciers and fine tuned by wind and water. Click here for gorgeous photos and detailed information about Chimney Bluffs. Finding concretions in creekbeds while creekwalking in Western New York State was one of the many fun discoveries I experienced while doing research for my guidebook “200 Waterfalls in Central & Western New York – A Finders’ Guide.” Click here to learn all about concretions, then pick up a copy of “200 Waterfalls in Central & Western New York” (or give the guidebook as holiday gifts) and plan some discovery trips of your own for next spring and summer. Central New York is home to some very unique geologic wonders only found here. Take Schoharie County’s Howe Caverns, for example. A prehistoric underground cavern six million years in the making, Howe Caverns is 156 feet below the Earth’s surface. Some newer additions to the mysterious limestone formations, the stalactites and the stalagmites include the Howe High Adventure Ropes Course, an aerial adventure; the four-tower Zip Lines, offering scenic views from up to 40 feet in the air; and the Howe Caverns Mining Company, a new 6,000-square-foot area filled with gemstones, fossils and arrowheads. Secret Caverns, also in Schoharie County, features a magnificent 100-foot underground waterfall beneath the hills of the Central New York Region. Nestled amidst 72 acres of woodlands in Montgomery County, lies the spectacular 45-foot-high Canajoharie Gorge. The gorge is a geologic wonder, home to fossils of ancient creatures encrusted in its walls of shale and granite. Canajoharie is known as the “pot that washes itself,” named by the Mohawk Indians because of the creek’s limestone bed. For more information on any of the natural wonders of the Central New York Region mentioned here, or to plan a visit, please stop by www.JustGoCNY.com.